Our final stage in the demystification of dahlia classifications is the mixed colors. 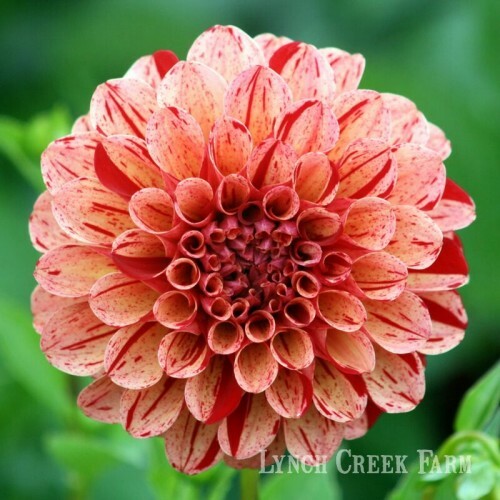 While many dahlias are perfectly uniform in their coloration, others combine a mixture of colors, some shading gradually from one color to another, others with distinct streaks, stripes, or zones on the ray florets and/or petioles. 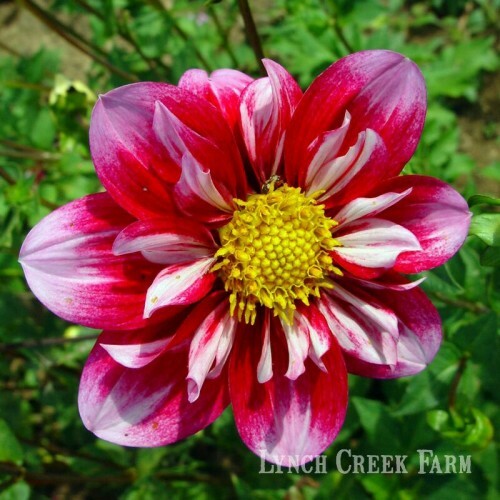 These combination colors are great favorites at Lynch Creek Farm, where dahlia tubers in the blends, bicolors and variegated forms sell quickly. 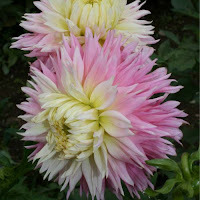 In a blend, the colors shade from one to another from the base to the tip of the petal-like florets. There are three blends recognized by the American Dahlia Society: light (LB), flame (FL) and dark (DB). Light blends involve pastel shades, dark blends incorporate one or more of the deeper colors, and flame blends are the brighter blends of red, orange, yellow and/or gold. At Lynch Creek, favorite light blends are Parfait, a big dinnerplate dahlia that shades cream to pinky lavender, and Just Married, a laciniated dahlia six to eight inches across. 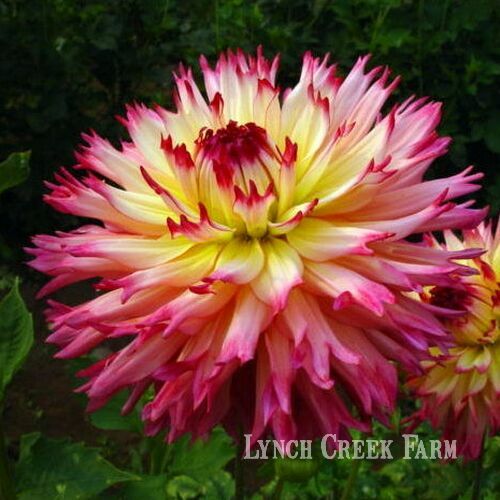 It shades from a lemony yellow near the base to creamy white to pink. A great example of a dark blend is Nenekazi, another laciniated dahlia in the same size range whose ray florets are yellow at the base, blushing to deep pink at the tips. 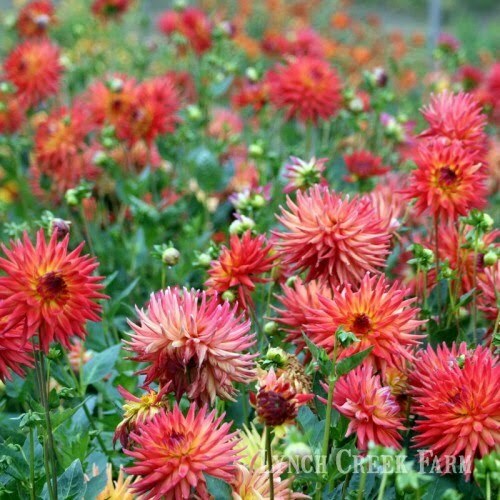 Typical of flame blends are Sea Fuego and Fire Magic, four- to six-inch semi-cactus dahlias. 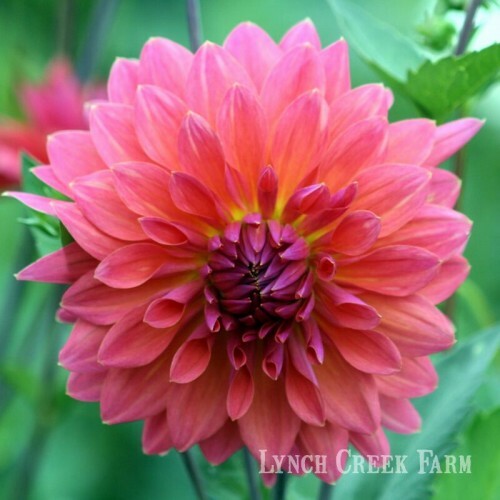 Sea Fuego deepens from golden yellow at the base to a warm red, and Fire Magic is described as a fuchsia-salmon-mauve blend with hints of dusty orange that "defies description," according to the Lynch Creek gang. A variegated dahlia incorporates more than one color in streaks or stripes on the ray florets or petioles. Miniature formal decoratives Hulin's Carnival and Amorous, both with two- to four-inch flowers on five-foot plants, are typical, with streaks and stripes of darker color running lengthwise on the ray florets. 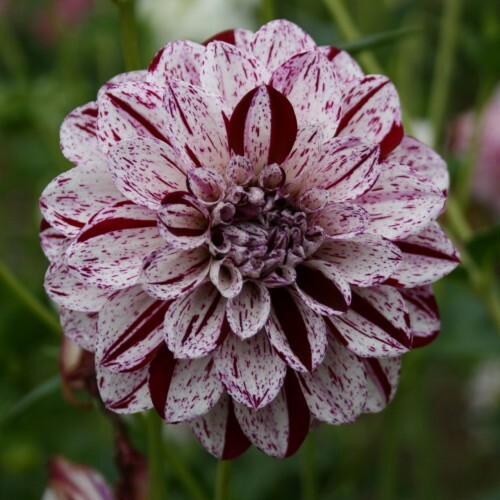 Hulin's Carnival has streaks of purple, burgundy and deep red on pale lavender-white petals while Amorous has crimson spatters on a light orange-apricot base. 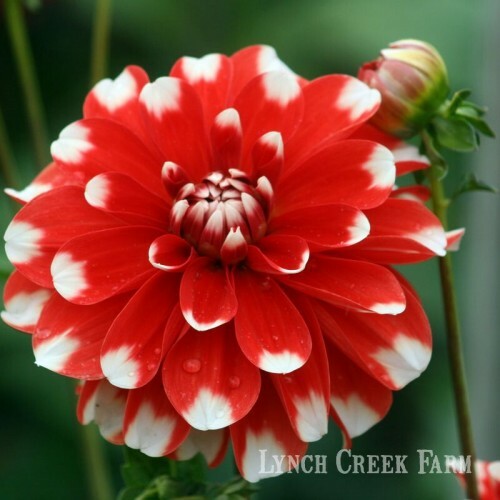 A bicolor dahlia (BI) incorporates contrasting colors, often a dark tone and white, in separate areas of the ray florets and/or petioles. 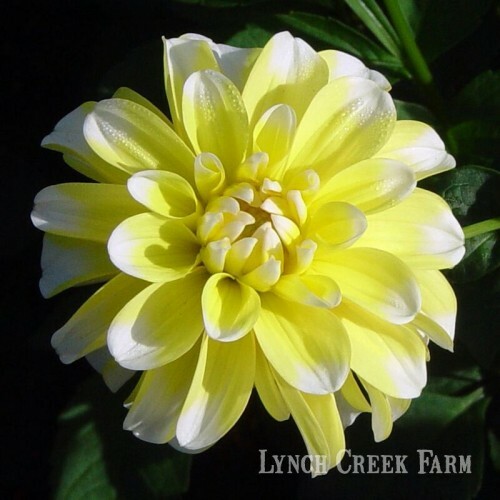 Lemon Candy and Candy Cane, small formal decorative dahlias with four- to six-inch blooms, feature white tips on lemon-yellow and bright red flowers. 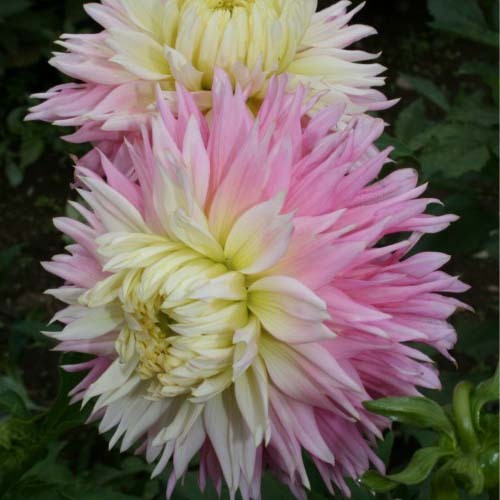 Then there's Double Trouble, a collarette dahlia; its ray florets are bicolored, with pink tips on raspberry red florets, and the petioles of its collar are variegated fuchsia and pink. 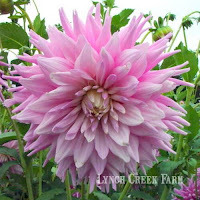 When a dahlia is identified in American Dahlia Society catalogues, the size comes first, then the form, then the color. Sea Fuego, for example, would be listed as B SC FL, with B the size designation for six- to eight-inch flowers, SC the code for semi-cactus flower type, and FL the listing for flame blend coloration. If you're just now picking up on these blogs, follow us back for the earlier descriptions of size and flower type listings.